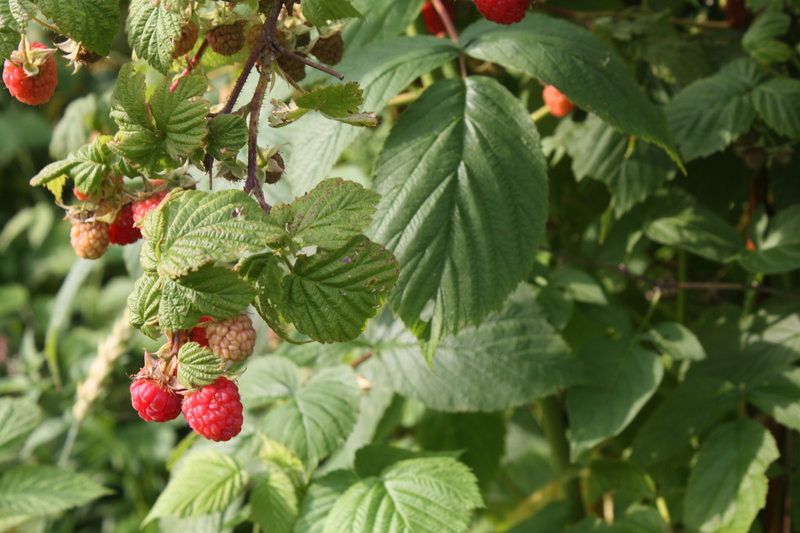 Another happy and productive week in the garden. Ample rain at just the right times and the crops are all responding well. Lots of changes everyday….and fun! So much to see. 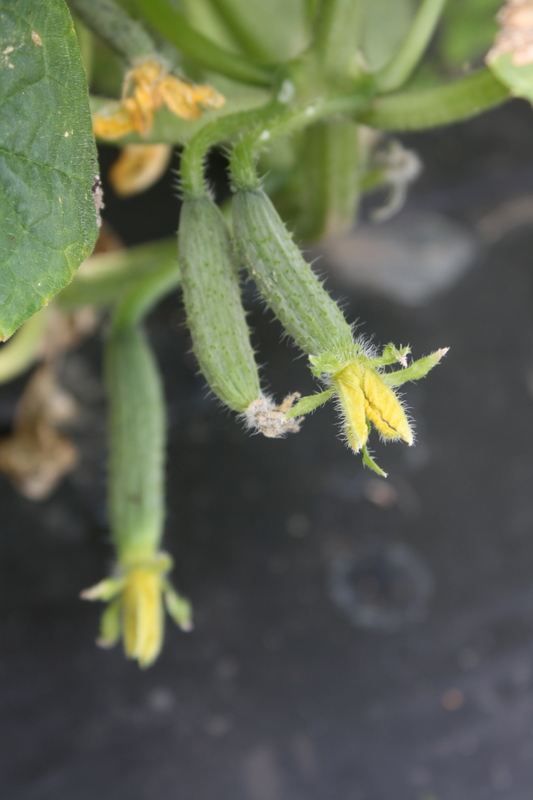 Cantalope blossoms on the vine. The story repeats itself this week of weed, weed and more weeding. But, it does feel good to be in front of things and it sure does look good. All our onions our now weed free (FINALLY) and glad that job is done as it is fussy and takes forever! 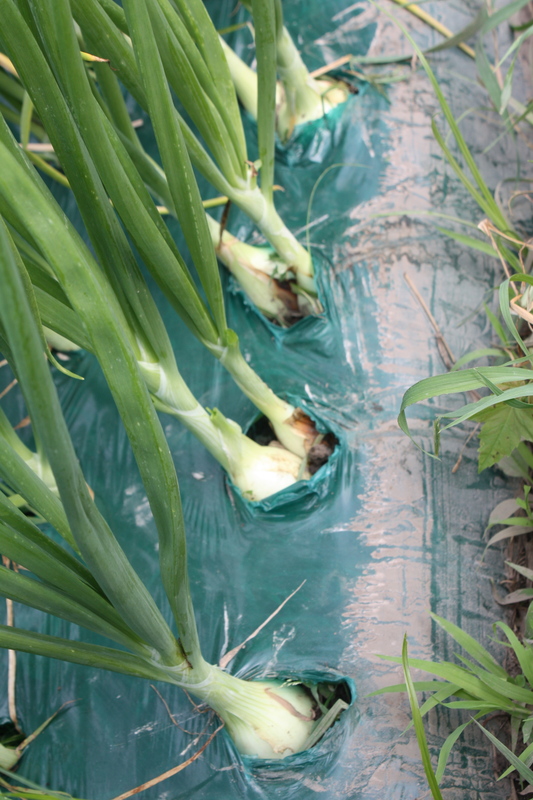 Our sweet summer onions are starting to head up and we are looking forward to the first harvest in a few weeks. 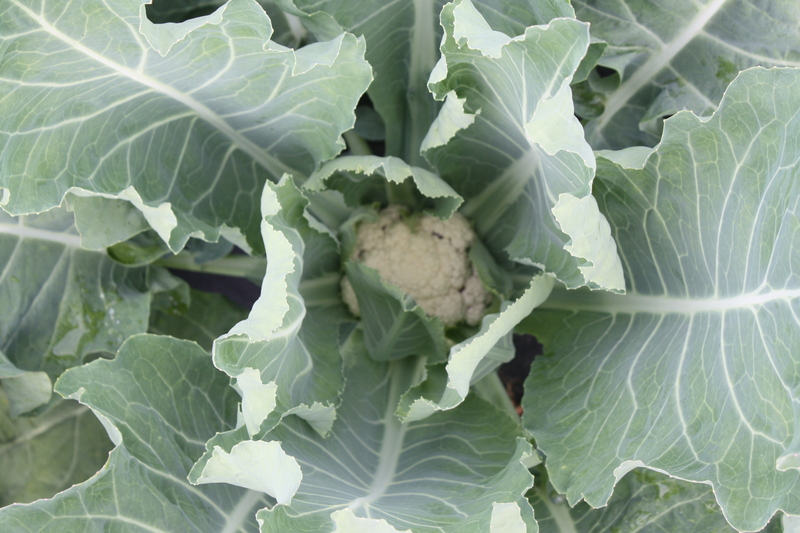 We quickly weeded our way through all the cauliflower in the back gardens and had a nice surprise. Our garlic looks fantastic this year and so do the potatoes. We have missed both of these items in our dinners for several months. Maeve asked when we were going to have mashed potatoes again this week and I could finally respond “soon”. 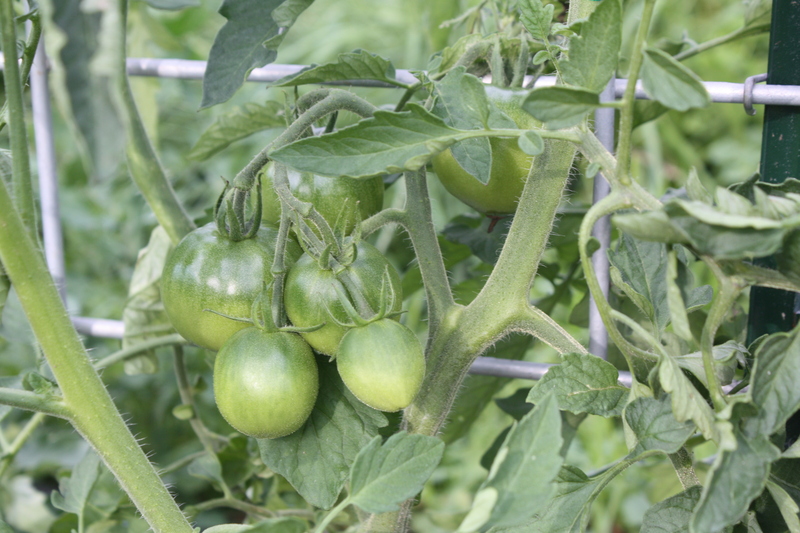 The tomatoes are several inches if not a foot taller than last year at this time when we look at the photos. 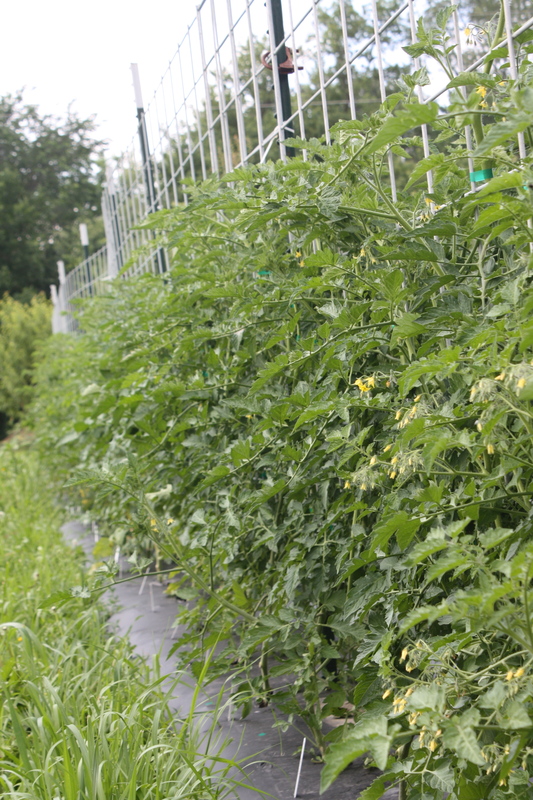 The crop looks strong and healthy and loaded with blossoms and baby tomatoes forming. 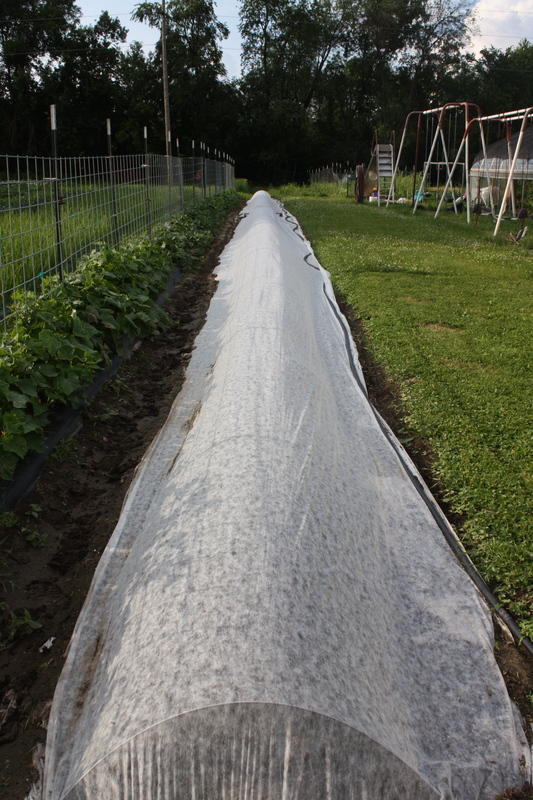 We are seeding in many late crops in the garden….and will start transplanting again this week the crops started in the greenhouse. Crazy that our thoughts are drifting to Autumn already. 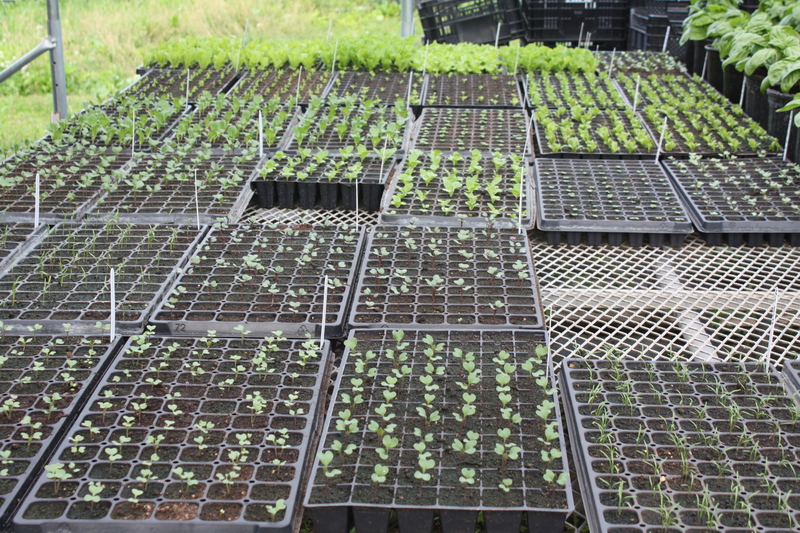 Baby transplants in the greenhouse. We hope a few members tried Kale Crisps last week as we sure are enjoying this quick summer snack at our house. Better than potato chips! 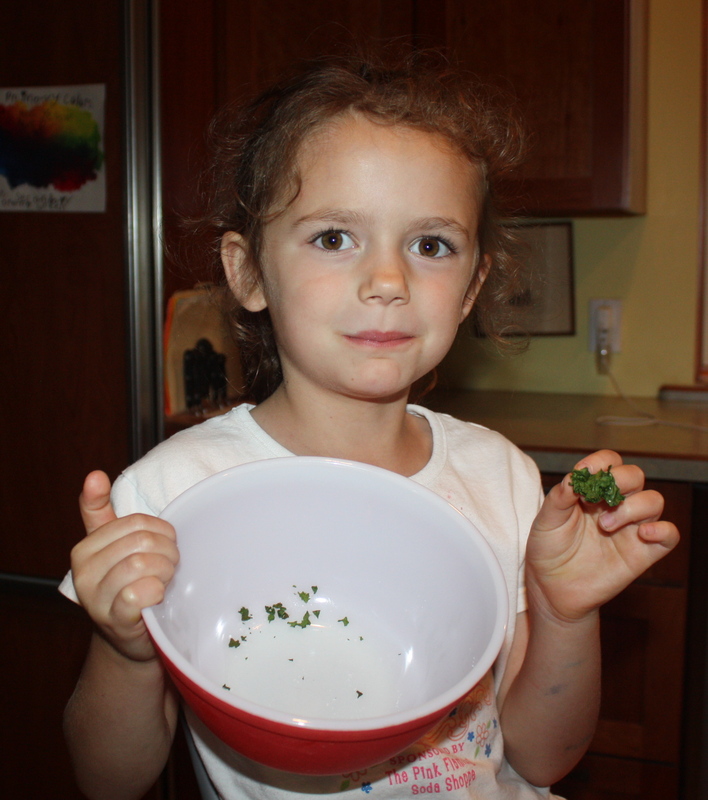 Maeve polishing off another bowl of Kale Crisps. Todays garden bounty…..310 pounds! Enjoy!!! A reminder…..please return your share bag and any reusable packaging for future use. Thanks! Swiss Chard-Hoop house grown and oh so tender. Much different than field grown chard. Eat stems and all if you choose. This is the end of the chard until Fall as we have pulled the crop. Summer chard is not as tasty. Slightly bitter and woody. 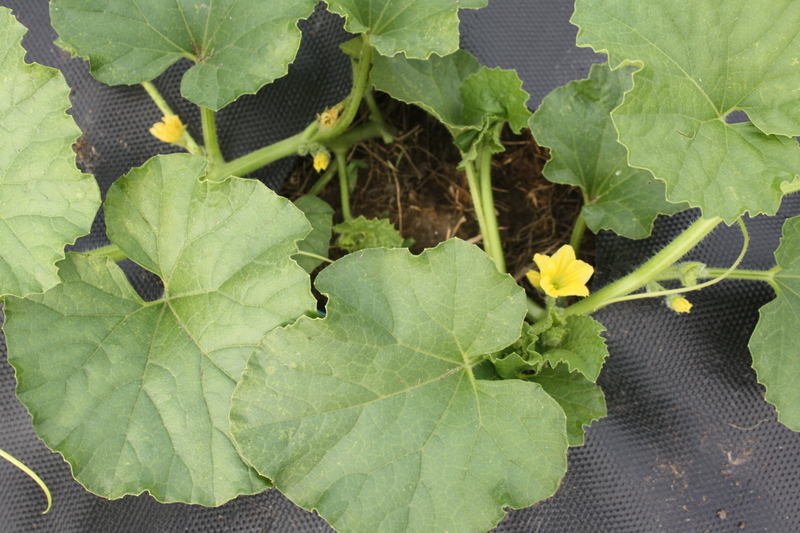 A new crop is started in the greenhouse now and we will harvest again in the Fall. 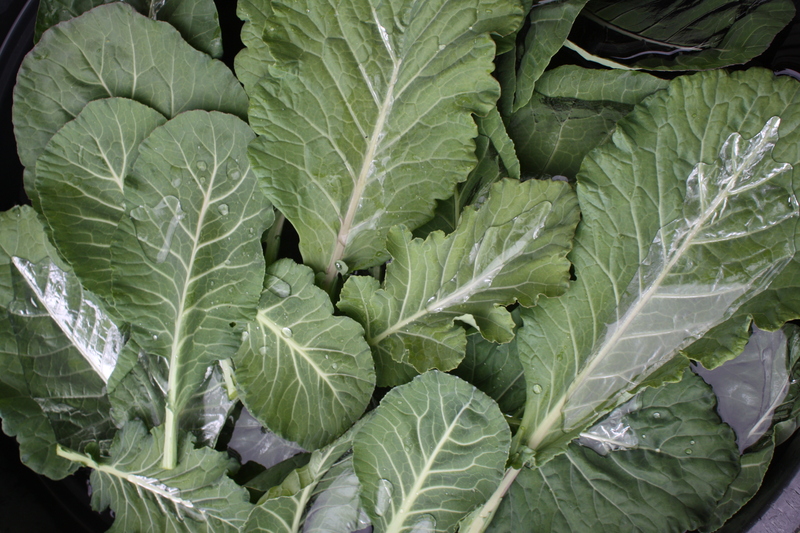 Collard Greens-A HUGE! favorite of mine. It maked the best coleslaw ever!! And I like to use it for my “bread” with sandwiches or as a roll up. Cut the center rib and use as you would loaf bread or wraps. 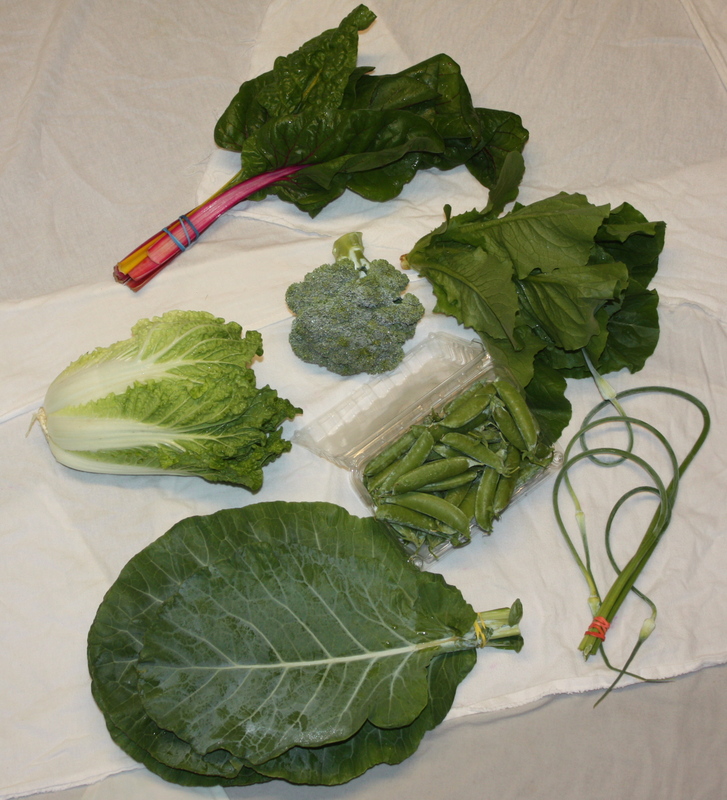 Collard greens harvest from a wet garden. Head lettuce-A crispy, deep green summer romaine from the hoop house. 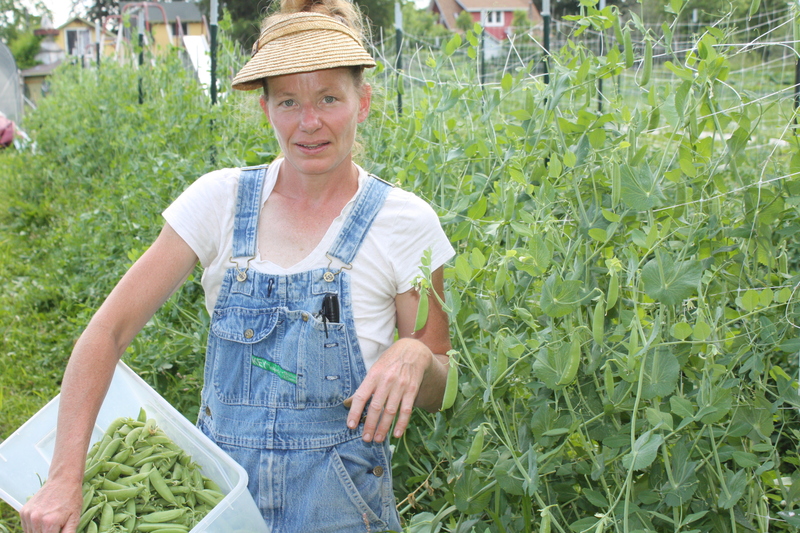 Sugar Snap Peas-Another bounty harvest from the patch! Enjoy fresh is best or lightly steamed. 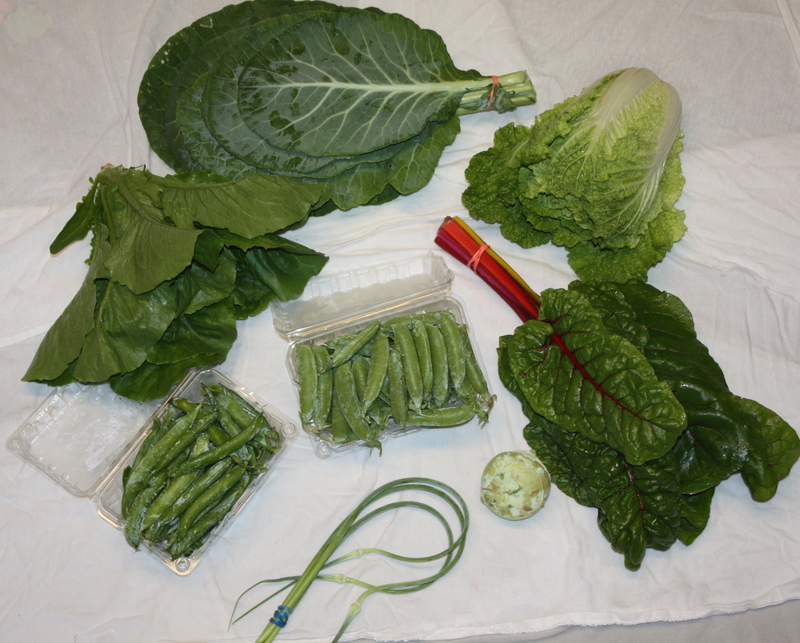 Chinese Cabbage-An early mini head variety. 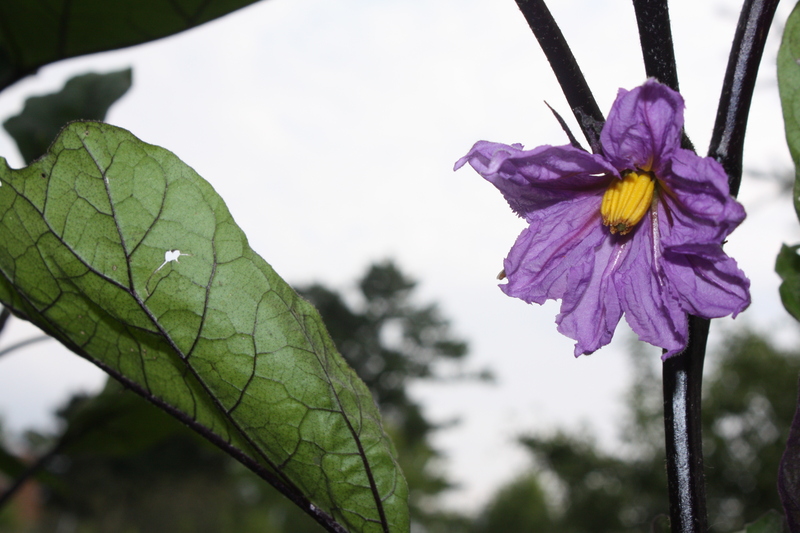 Great in fresh salads or delicious in stir fries. LONG storage life in the crisper drawer of the refrigerator in a plastic bag. Garlic Scapes-Last bundle of these little treats for the season. 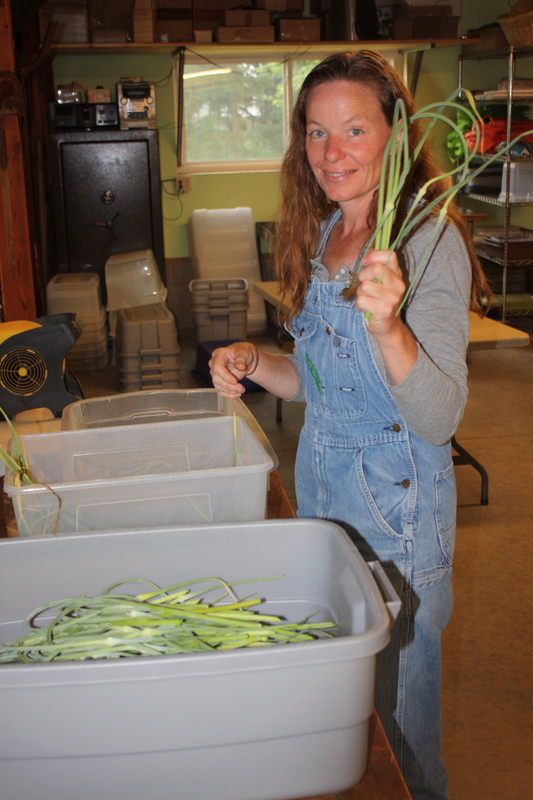 Bundling up the last harvest of the garlic scapes. Broccoli-The start of the harvest from the early broccoli patch. BARABOO SNACK PACK ONLY THIS WEEK. 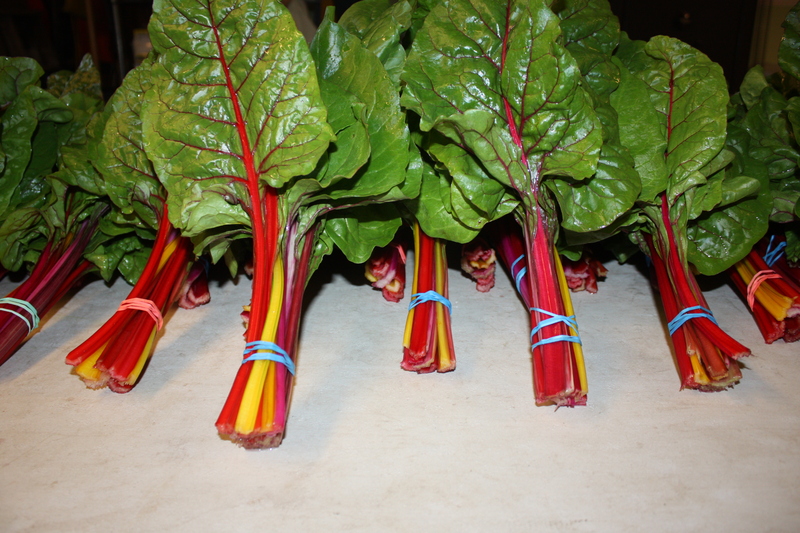 Swiss Chard-A nice big bunch….Hoop house grown and oh so tender. Much different than field grown chard. Eat stems and all if you choose. This is the end of the chard until Fall as we have pulled the crop. Summer chard is not as tasty. Slightly bitter and woody. 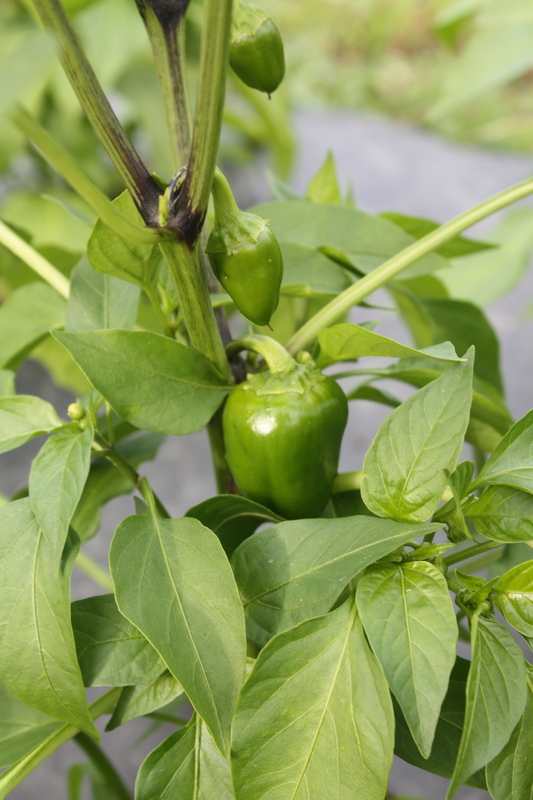 A new crop is started in the greenhouse now and we will harvest again in the Fall. Pretty bundles ready to be tucked in this week’s Full Shares. Collard greens in the wash tank. The water pools on the leaves and looks like silver. Sugar snap harvest. AND! that pretty visor again…. 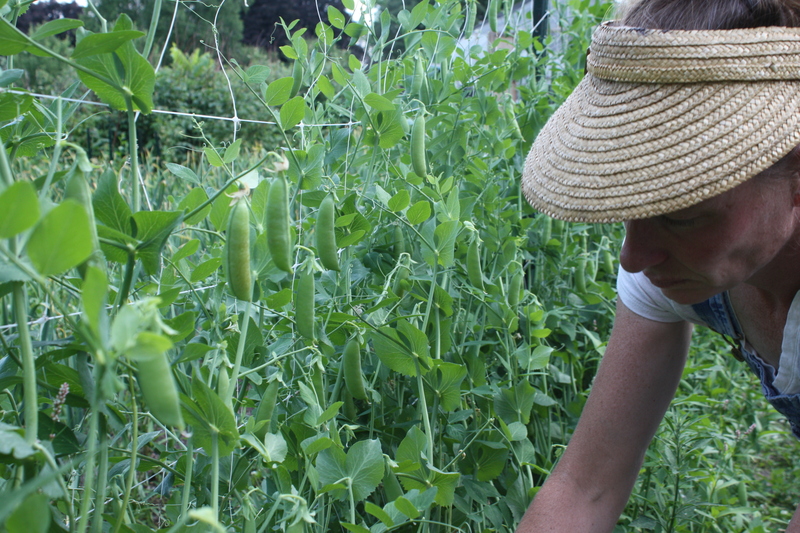 Shelling Peas!-A nice big container. A lot of work to shell but delicious. Eat peas only. NOT shell. Enjoy fresh in salads or lightly steamed with salt and butter. 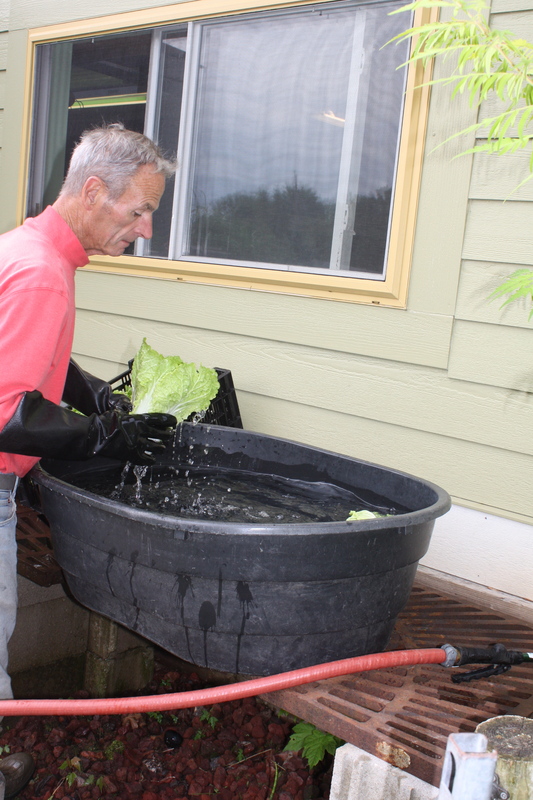 Scott double rinsing the chinese cabbage. 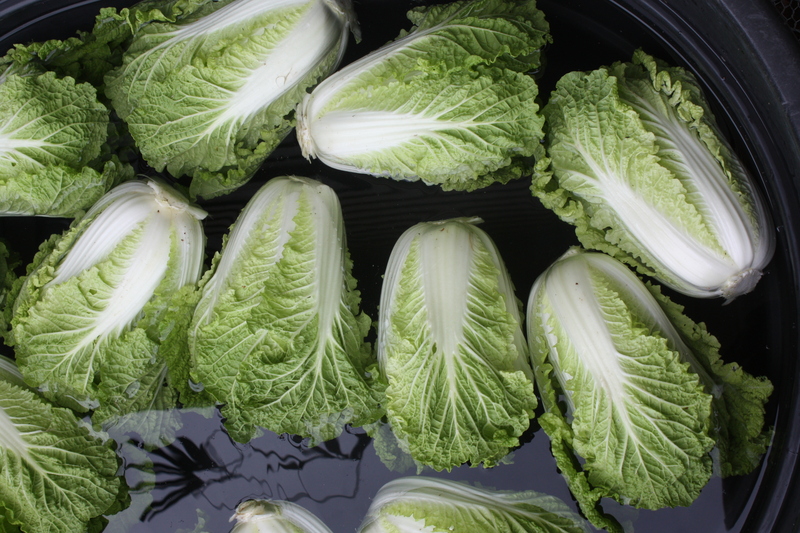 Chinese Cabbage soaking in the wash tank. Kohlrabi-Another snappy treat to add to this weeks salads. 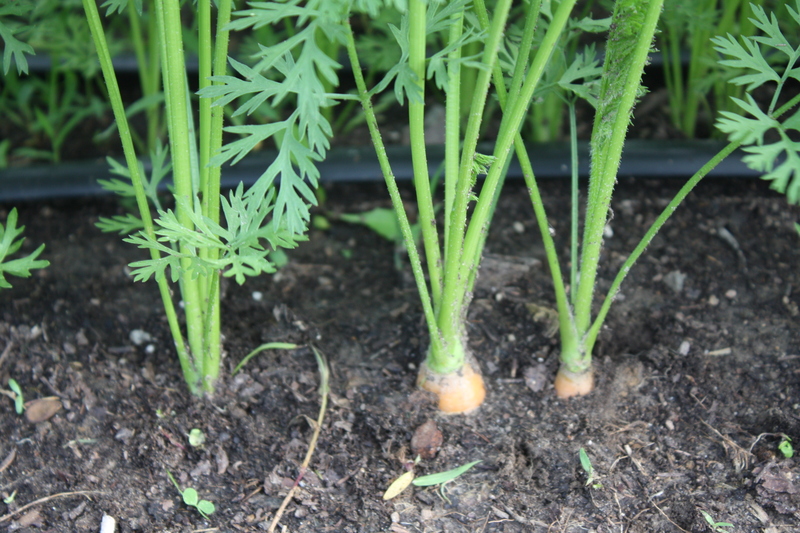 BEST GUESS FOR NEXT WEEK-carrots!, leaf lettuce, sugar snaps, broccoli, mini cabbage heads and more…..